Marble can be lovely in a home, giving it an air of distinction, and a little goes a long way. Marble has long been associated with wealth and grandeur, and if you wish to give a room a special touch, marble may be the way to do it! 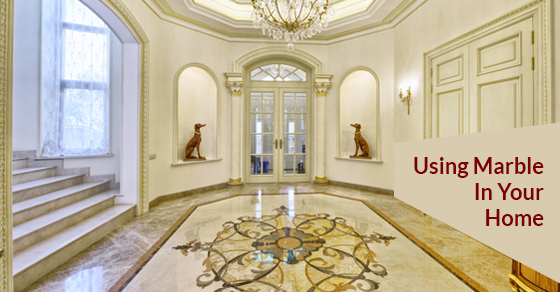 Here are some ways you can introduce the timeless and classic look of marble into your home. Let’s face it, marble is an expensive material, and incorporating it into a space in small measures is enough to make a statement. Kitchen countertops made of marble are stunning, and since marble wears well, they are practical, too. You may even consider incorporating marble as a backsplash. Cradling the fireplace with marble will give your living room an air of distinction. If an entire surround is outside your budget, a mantel or marble fire screen would be lovely. Marble comes in various colours and textures, so you can choose pieces that will work in your overall decorating scheme. When food is placed on a marble surface, it looks like a culinary masterpiece—even if it’s a bowl of KD! So, shelling out some extra cash for a marble top dining room table will be sure to wow your dinner guests every time! A modern bathroom design will really pop with touches of marble! A shower stall that is tiled with marble just may be the showpiece of your home. No matter where marble is located, it is sure to add to the overall value of your house, should you ever decide to sell. Marble shelves in a bathroom would nicely show off your perfume bottles. Marble does well in humidity, so it’s a perfect material for the bathroom. Nightstands with marble tops—how classically romantic! Marble can also handle water, so if your beverage accidentally spills on your night table, it won’t affect the look of the piece. Water leaves stains on wood, which most night tables are made of. If your office space is in need of a face lift, have a desk built with a marble desktop and shelving. Marble is a cool surface, both literally and figuratively, and a workspace should be comfortable and sophisticated. Whether you’re using marble in a modern bathroom design, or for practical marble pieces like a marble cutting board or paper towel holder, it’s a material that will always stand the test of time.